Greek Prime Minister Alexis Tsipras's plan to hold a referendum on Sunday on creditors' demands for austerity has prompted a breakdown in talks with lenders, forced Greece to shut banks and left its future in the euro in doubt. The result of the vote remains unclear as campaigning gets underway in earnest. But whether Greeks choose 'yes' or 'no', the country is expected to face a new period of uncertainty and political turmoil. 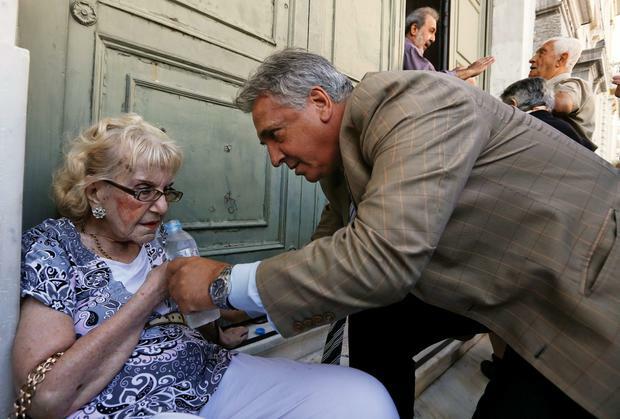 Greece's left-wing government has openly urged Greeks to vote 'no'. It would be political suicide for Tsipras to implement a programme he has repeatedly called a "humiliation" for his country and which he has vehemently opposed. Tsipras has strongly hinted that he would step down in the event of a 'yes' vote, telling Greek television this week: "If the Greek people want to have a humiliated prime minister, there are a lot of them out there. It won't be me." If Tsipras resigned, the country would normally be expected to go to snap elections - with September cited as a likely time. But given Athens faces major debt payments later this month and is at the peak of a financial crisis that has forced it to shut banks, the president is likely to push for the formation of a cross-party, "national unity", interim government to continue talks with lenders and keep Greece afloat until elections are held. Pulling together such a government will not be an easy feat. Pro-euro parties like the centrist To Potami, the centre-left PASOK and the conservative New Democracy have signalled their willingness to take part in such a government. But together they hold only 106 seats in the 300-seat parliament. That would mean Syriza and its junior coalition partner - the right-wing Independent Greeks party - would have to support or join such a government to keep it going. Such a government would likely be led by a non-partisan or so-called technocrat; Former Prime Minister Costas Karamanlis made a rare public address urging Greeks to vote yes on Sunday, setting tongues wagging that he could be one such candidate. A national salvation government would not be unprecedented in Athens. The last time Greece flirted with a referendum - in 2011 when former Prime Minister George Papandreou sought one before scrapping it and being ousted - a technocrat government backed by the major parties replaced him until elections were held the following year. Some Syriza officials say in the case of a 'yes' vote, Tsipras himself might opt to stay and attempt to keep negotiations going with lenders on the understanding that the country would head to elections once the country's finances stabilised by September. Euro zone policymakers have openly spoken out in favour of a "yes" vote. Chancellor Angela Merkel has signaled that she would be ready to negotiate a third bailout package for Greece, though German officials are skeptical about whether a new pro-bailout government can be in place and have negotiated a third package by July 20th when a crucial payment to the ECB is due. Greek government officials say a "no" vote would strengthen Greece's negotiating hand with creditors, a prospect that euro zone policymakers, including the head of the euro zone finance ministers, Jeroen Dijsselbloem, have flatly denied. Tsipras's government has said it would immediately resume talks with creditors. But European officials believe it would be very hard to agree a new bailout since the 'no' vote would be interpreted as a rejection of engagement with creditors. Euro zone policymakers have warned that a "no" vote would signal a rejection of the euro and shut the door on the prospect of further aid from creditors, leaving the country in uncharted territory and isolated within the euro zone bloc. Greece would likely end up defaulting to the ECB on huge payments due on July 20 and see its financial crisis deepen rapidly, with banks unlikely to open amid the uncertainty. The ECB would likely continue to freeze or yank emergency funding to Greek banks, further raising pressure on Tsipras as he tries to reach a deal in the midst of a full-on banking collapse. That in turn could force Tsipras to resign to pave the way for a national unity government. The government could also opt to issue a parallel currency or IOUs to tide it over - effectively setting in motion a "Grexit".